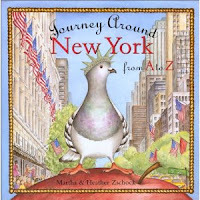 Today's Big Apple Books is brought to you by sisters Martha & Heather, an illustrator/author team whose Journey Around New York from A to Z is a pure delight. The illustrations are colorful & vivid; there's just so much to look at on each page! And on a side note, having a picture of a giant pigeon on the cover of a book about NYC just makes me chuckle. There are lots of "A to Z" books out there, but I like that the Zschock sisters thought outside the box on this one... for instance, "I" stands for "Immigrants imagine a better life" and features a drawing & description of the Statue of Liberty. "Z" stands for "Zillions of commuters zip beneath the zodiac," which, of course, describes our beautiful Grand Central Station. I look forward to sharing this book with Toddler S & her sibling when I'm not afraid they'll tear the pages (that's just how much I like it). Never realized there were so many NYC children's books around! I like that the focus on this book in New York. 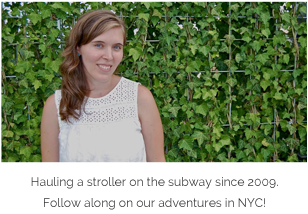 It must be fun to read when you live there.